(drag and drop also works). A save prompt will be generated asking where to save the file. 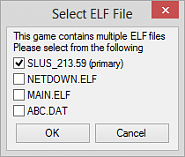 Select which files to extract and a save prompt will be generated for each selected ELF.